or interrupted blood flow to the eye’s optic nerve. healthy, functioning optic nerve, vision would not be possible. temporal arteritis (inflammation of certain arteries, including those to the eye). What are the symptoms of ION? ophthalmologist or physician immediately if you experience such episodes. TIAs are warning signs that a complete blockage of blood flow to the eye may occur. An ophthalmologist may be able to detect warning signs of ION during an eye examination. 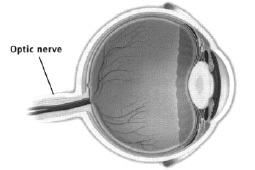 The examination may involve dilating (temporarily widening) the pupil with eyedrops in order to check for swelling of the optic nerve or inflammation of arteries in the eye. Tests for intraocular pressure and glaucoma may be performed, as well as testing your side vision. What are the effects of ION? When blood flow to the optic nerve is reduced or blocked, the nerve is deprived of oxygen and nutrition. Without sufficient oxygen and nutrition, the nerve cannot function properly and will eventually die. The amount of vision loss depends on how much and how long the optic nerve was deprived of oxygen and nutrition. If ION was caused by temporal arteritis (inflammation of arteries in the eye), patients have a very high chance of the other eye being affected unless treated with steroid tablets (cortisone). The steroids help prevent ION from occurring in the other eye, but rarely improve vision lost from ION in the affected eye. In most cases of ION, there is no proven treatment to improve vision. However, the use of low-vision devices and techniques-including large print materials, bright lighting, high contrast materials and magnifying devices-can help you continue to perform many of your daily activities independently.